At Stonexchange, quality natural stone products at wholesale prices are just a phone call away. Our Florida-based company provides builders and subcontractors with the finest stone window sills, shower curbs, and flooring tiles on the market. We are a direct importer specializing in bulk product delivery to our valued customers in the United States. One of the most popular stone materials used for interior window sills is travertine. We can supply our customers with every one of the standard widths and thicknesses of travertine window sills, and our bulk import practice allows us to save the customer a tremendous amount of money. We contract directly with overseas quarrying operations and ship factory-cut window sills in specially packed crates, ready for installation. Travertine has been a prized building material since the days of the Roman Empire. This natural stone is known for its distinct colors which are the result of contaminant compounds. Travertine is a form of limestone that forms when water percolates through a rock layer. This often occurs in areas containing geysers or hot springs. Travertine is often full of small holes and inclusions. This rustic appearance is very appealing and gives builders a material that exudes a look of authenticity. The color shade complements lighter colored flooring and walls very nicely. Our company ships travertine products directly from the quarry and manufacturer to our headquarters in Miami. We stock every type of finished product, from window sills to floor thresholds. Our travertine is Ivory Medium, which is the color shade preferred by most customers. The cream or beige floors that are quite common in Florida are complemented nicely by the medium tone of travertine. Travertine is cut into large slabs at the quarrying site, sent to a specialty cutter, and sawed into the desired length, width, and thickness. The orders are filled overseas and carefully packed into wooded crates. The bulk order is then sent via container ship to our headquarters in Florida, where it is then distributed to the customer address. A natural stone window sill provides excellent protection against water intrusion, and its lasting quality increases the value of the property. Travertine is one of the most popular materials used for window sills in Florida, but the prohibitive cost of this material in the 20th century made it difficult for many people to obtain it. Our direct import service makes it much easier for contractors to order this product in bulk, and we offer our commercial customers’ window sills cut to match the common window frame dimensions. We have a constant flow of orders and always have a shipment in process. As a result, customers can rely on us to provide the exact number of required pieces in whatever length, width, and thickness is needed. We stock all common and special sizes including 5”X74” and 6”X74”. We also have all widths starting from 3 inches to 12”X74”. Most window frames require a sill that is 74 inches, 56 inches, or 37 inches in length. Our overseas manufacturer cuts sills for each of these required lengths, and our sills are available in widths ranging from three inches to one foot. Most customers require 5/8-inch thickness, but we can also supply travertine sills that are 3/4-inch thick. Depending on the type of sill ordered by the customer, our minimum shipment will be either 50 or 100 pieces. This bulk shipping method saves the customer a great deal of money because our import tariffs are reduced. When the order arrives at our company headquarters, it is carefully inspected and sent directly to the job site or to the contractor’s business location. Many window sill project instructions call for colors such as Roman Travertine, Iroc Beige, and Durango Cream. Our Ivory Medium travertine sills are perfect for projects calling for a shade matching these varieties. We ship our natural stone materials in bulk. Our service is intended to provide contractors and construction companies with large quantities of travertine material, ready for installation in new housing or commercial developments. Home improvement suppliers will also benefit from our bulk ordering service. Our customers in the remodeling business will enjoy the wholesale prices on orders for 50-100 pieces. Tile stores and flooring product retailers that stock travertine on a regular basis will also be able to take advantage of our low prices on medium-size crate orders. We manufacture and import travertine sills constantly and each size is in stock at least 3000pcs at all times. Because we keep a huge inventory in our Miami warehouse, we can often fill a small order of 100 pieces in a single day and ship it within 24 hours. Larger orders for thousands of window sills requires a lead time of two or three months. These orders are filled by our overseas manufacturer and sent via container ship in large packing crates. Each order can be custom-designed according to the current requirements of builders and subcontractors. We understand that not every order will be the same in terms of window sill lengths, widths, and number of pieces, and we do not charge extra for changes made that override the instructions for previous orders. Our company does not cut any travertine into window sill pieces. Instead, our overseas quarrying operations partners do this for us. However, if a customer wishes to obtain a large selection of travertine products in a size that is not standard, we will be happy to design a custom order. This may require a longer shipping time than an order made up of standard sill sizes, but so long as the order meets the minimum piece requirement, our company is ready to help. Our warehouse contains a large inventory of window sills made from travertine. We pack our shipments in strong wooden crates that are stackable, making it easy to load them onto a trailer. The travertine pieces are packed with cushioning material that helps to minimize breakage during transit. 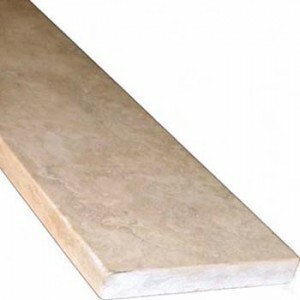 We ship travertine sills nationwide using a commercial delivery service, and because we ship only in bulk, customers enjoy quite reasonable freight charges when ordering from our company warehouse. We sell only full crates of our natural stone products. Our company will carefully perform a complete quality inspection prior to loading and distributing orders. Upon arrival at the job site or business location, customers can inspect the product and report any breakage to us. In addition to being a popular window sill product, travertine is also used for walls, mosaics, and outdoor paving projects. Travertine is often tumbled to produce a more rustic look, and customers in Florida often use this stone for thresholds, fireplace mantles, or to accent the bathroom. We also supply our customers with a full line of other threshold materials including marble and granite. Interior thresholds act as a boundary material between two different types of flooring surfaces. Thresholds are often used in the bathroom as a water barrier. We supply threshold material in travertine as well as Absolute Black Granite, Nuevo White Carrara, Crema Sahara Marfil, and Pure White Thazoz. Our natural stone products are available with straight borders or beveled edges. Customers can check out the various styles and edges on our company’s product pages. Marble saddle thresholds are available in sizes from 36-inch to 74-inch lengths. Most threshold orders require a minimum of 50 pieces. We strive to bring the finest travertine and marble products to our customers. That is why we personally contract with only the most experienced quarrying operations and stone cutting experts in the world. Our overseas manufacturers have many years of experience in the art of shaping and cutting natural stone products. Our orders are usually designed to allow for up to 10 percent breakage. This is standard in the industry and is nearly always figured into the overhead costs by the commercial customer. However, we operate on the principle of top-quality service as well as top-quality materials. Our bulk shipping service has proven to be the most reliable method of transporting natural stone with a minimum of damage. We will be more than happy to discuss orders for new customers and provide information about overseas shipments of natural stone products. Whether the job calls for 100 pieces of 3 X 37-inch travertine sills or a huge shipment of threshold material, our company is ready to offer the lowest prices available. Remember that bulk ordering may require a special cutting operation performed overseas, so a lead time of as much as 10 weeks may be necessary. We have a continuous supply of travertine coming into our Florida warehouse, but if the customer requires a special order for non-standard sizes, we are ready to assist. Please use the handy contact page to direct any questions to our knowledgeable sales staff. Our company is proud to provide the customer with the finest quality natural stone products available anywhere, and we offer the best pricing, guaranteed! Contact us today.